For the hexified panel quilts, you need 7 repeats in order to have six repeats for the kaleidoscopic hexies, plus an additional repeat to frame. 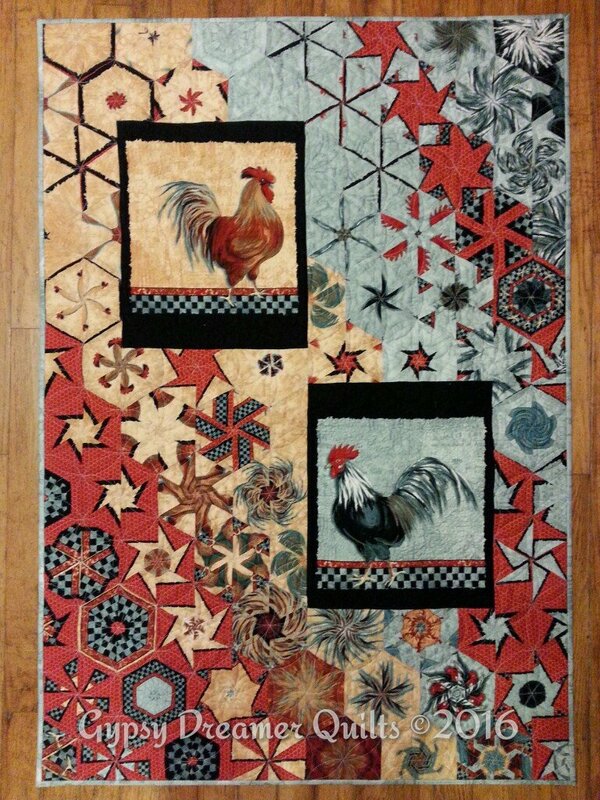 For this introductory class, I recommend selecting a panel with 6-8 ~12"pillow panels or two ~24x22” panels across the fold from each other. These can be divided up to make several smaller projects to learn the process. Prints should have at least four (4) colors or tones, some negative/background space with movement, and a variety of design elements. To calculate yardage needed for the hexagon blocks based on the various repeat measurements, use the following formula. For narrower repeats, the same formula can be used x the width of the repeat. Be sure to add a seventh repeat of the panel to frame. Typically, I measure out 7 repeats of the panel first, and then go back and measure as yardage. For 24” repeats: 24” x 7 = 168” ÷ 36” = 4.67 yards. If using yardage with a one-way print, allow ~¼yard extra to adjust the cut for your framed panel if necessary.